Here is a delayed message from yesterday’s round, about the game between Dutchman Maurice Schippers and 14-year-old Norwegian talent Jens Ingebretsen, who by the way is doing excellently so far with 4/7. Black played 51...Qg5+ here and the game ended in a draw. 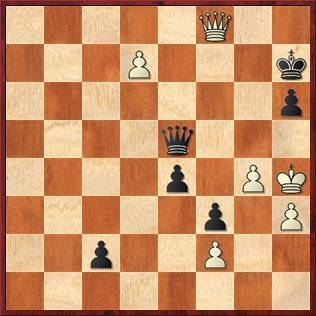 As Thomas Beerdsen pointed out, Black had an amazing win with 51...c1Q 52.d8Q Qcg5+ 53.Qxg5 hxg5+ 54.Kh5 Qe6!! 55.Kxg5 e3! 56.fxe3. White has no useful queen moves! So Black wins with 56...Qg8+ or even 56...f2 first. Would you say Magnus would have spotted this at 14...? 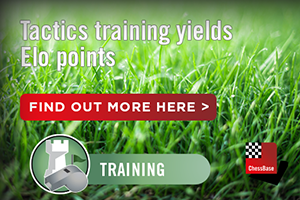 The 5th round of the matches has started, but there are technical problems with the live boards. Vladimir Fedoseev opened with 1.e4, Van Foreest replied 1...c5 and after 2.Nf3 d6 Fedoseev thought for a while before playing 3.d4. After 3...cxd4 4.Nxd4 Nf6 5.Nc3 a6 the Russian started to think again for several minutes. During those minutes Sam Shankland pointed out to the arbiters that the clock for his game wasn't running, it turned out they hadn't pushed the button hard enough. 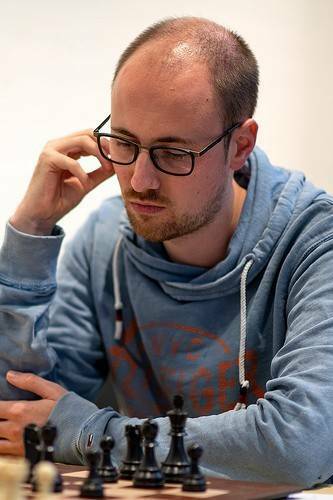 With chief arbiter Frans Peeters the time was 'reconstructed' (Peter Svidler took a walk because at one point, after Ne5 in the Fianchetto Grünfeld, he had thought for 2 minutes) and the game continued. 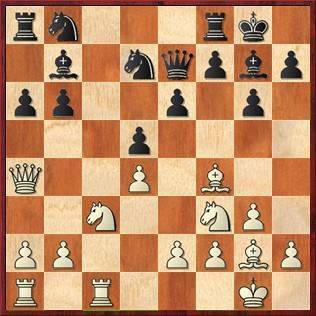 Only after this did Fedoseev decide on 6.h3. 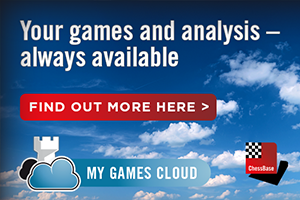 Needless to say we're doing everything we can to show you the games online games again! Today the semi-finals of the Open started. Bassem Amin is playing Eltaj Safarli (a Scotch game) and Erik van den Doel confronted Dmitry Kryakvin with a London System. 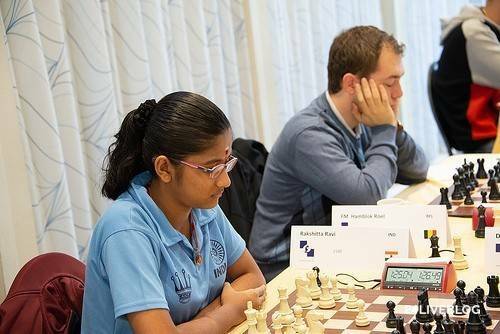 Unfortunately Roel Hamblok had to withdraw from the tournament, which means that his opponent, 13-year-old Rakshitta Ravi from Chennai, has no opponent today. It didn't have any consequences for a possible WFM title, as she has already passed the 2200 border earlier this year. 'But I didn't apply for it', the young Indian girl said. 'I want to obtain the WIM title.' She can do this tomorrow, in the last round of this event. Probably the only thing she needs for this is a titled opponent, and since she will have 5/8 after today this chance is quite large. Rakshitta has made WIM norms earlier this year in Cappelle-la-Grande (March) and in Pardubice (July). She will be playing more tournaments in Europe after this. 'I have full-time leave from school and I make my exams in writing', she explained. 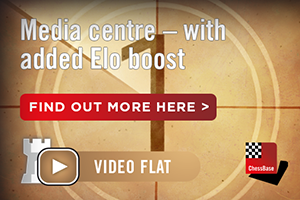 Commentator GM Ivan Sokolov called the contest between Vladimir Fedoseev and Jorden van Foreest 'a thematic match'. 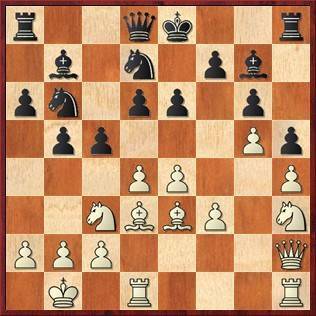 Today the Russian opted for Fischer's move 6.h3 against the Najdorf move 5...a6, which has a less good reputation in the Scheveningen. So, Jorden replied not 6...e6 but 6...g6, to turn it into a not-too-dangerous Dragon for Black. 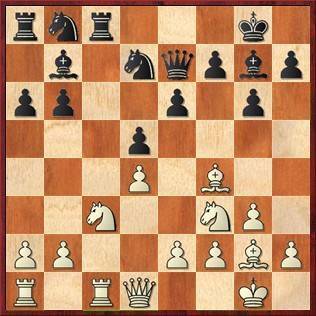 After 12.Nd5 the former Dutch champion allowed the damaging of his pawn structure by the capture on f6. Now Black's only weakness is d6, but he does have active play on the half-open c- and e-files for it. Sokolov explained that if Black had taken on d5 himself, then after 13.exd5 Bxd4 14.Qxd4 Black does have the half-open c-file again, but it is White who has the e-file, with pressure on the e7-pawn, and eventually he can push his h-pawn to harass the lone black king. Ivan had expected something sharper from Shankland, in view of his match situation, than the Fianchetto against Svidler's Slav/Grünfeld set-up. 8...b6 is a move Magnus Carlsen has played, but it's less well known than 8...e6 wih the idea ...Nfd7, which was played 5 or 6 times by Kasparov against Karpov in their World Championship matches. 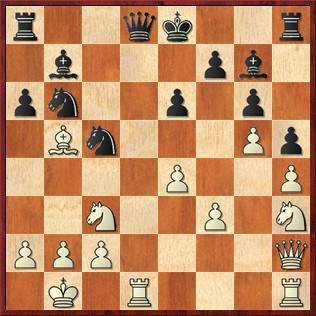 Even though White played 7.Ne5 and later 13.Nf3, as well as 10.Qa4 and later 14.Qd1, he still had a small development advantage as Black could not well play ...Nc6 due to e2-e4, with complications that often favour White. An interesting fight 'under the surface' for the centre. 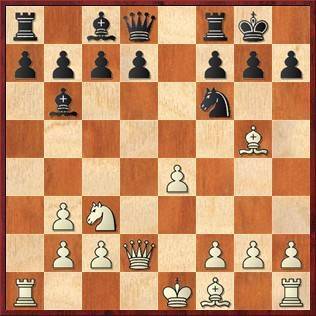 Bassem Amin has built up a good edge against Eltaj Safarli, mainly because of his pressure on the d5 isolani. Van den Doel's London System has yielded him, quite characteristically for this line, somewhat freer play but Black seems to have no worries as he is very solid. In this game, Black's weak d6-pawn has now been exchanged for White's weak e4-pawn, and as a result the endgame looks pretty drawish. But we know for sure that Fedoseev (or perhaps both players?) will be trying some more. Stefan Kuipers, the 'Best of the Rest' from the open last year, won't be able to repeat that success himself. Today he tried to fool Indian IM P Karthikeyan, but instead got fooled himself. Today's draw between Sam Shankland and Peter Svidler looked pretty placid, but under the surface horrible things had been going on. Svidler: 'Now, after 14.Qd1, indeed I cannot play 14...Nc6 because of 15.e4, so I wanted to play 14...Rc8 and ...Nf6. After this move the position was just completely dead, according to both players. 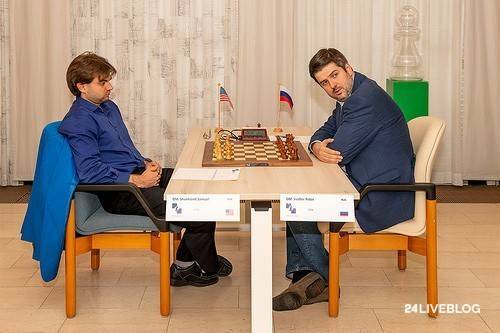 Svidler: 'I was panicking here because I saw some crazy lines. For example, 15.e4 dxe4 16.Ng5 and here I had been planning 16...f5 but it turns out that 17.Ncxe4 is more or less winning.' After 17...Rxc1 18.Rxc1 fxe4 19.Nxe4 Black has no good moves, e.g. 19...Nc6 20.Nd6 or 19... h6 20. 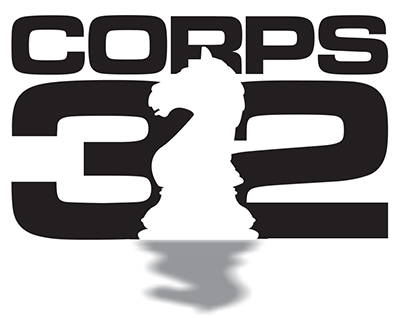 Rc7 Bd5 21.Nc3 Bxg2 22.Kxg2 g5 23.Qf3. The players also talked about 17.Qb3 Re8 18.Bf1 but here Black is OK after 18...b5 or even better 18...Kh8. 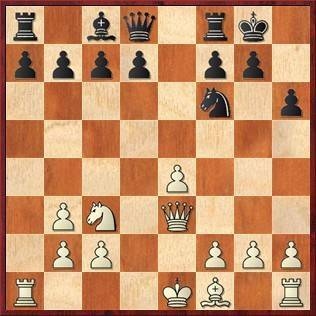 Instead of 16...f5, however, 16...Nc6 is playable, e.g. 17.Ncxe4 e5 'and I thought this was bad for me, but it seems to be OK', Svidler concluded. Bassem Amin in the final! Bassem Amin has reached the final by outplaying Eltaj Safarli, who went wrong just after the opening. but here probably 12...d5 was too wild an attempt to free himself. 12...Re8 may still have been OK.
After 13.0-0-0 Amin could press the isolani and eventually won, incidentally also passing the 2700 limit again. The position in the game Erik van den Doel-Dmitry Kryakvin is equal but there is still some tension. 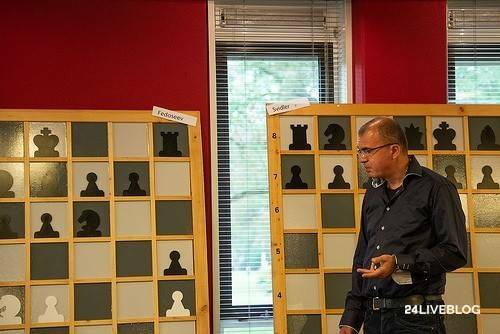 The Dutch GM made his 40th move with 1.19 minute to go and then very coolly left the board to get a cup of coffee. He was apparently pretty sure he had indeed made 40 moves! 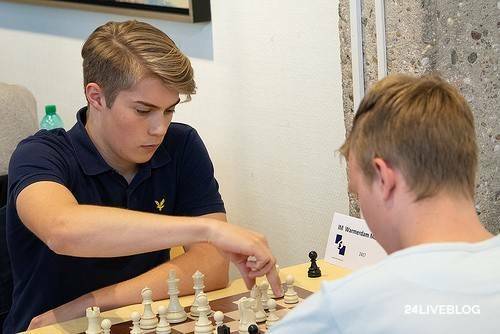 German aspiring IM Valentin Buckels is leading after a good victory against P Iniyan, together with Thomas Beerdsen who beat his teammate Nico Zwirs after gaining a 'small exchange'. 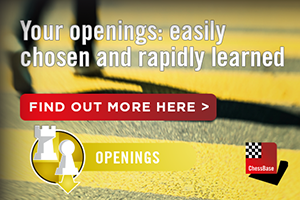 Roeland Pruijssers is on his way to joining these two leaders. 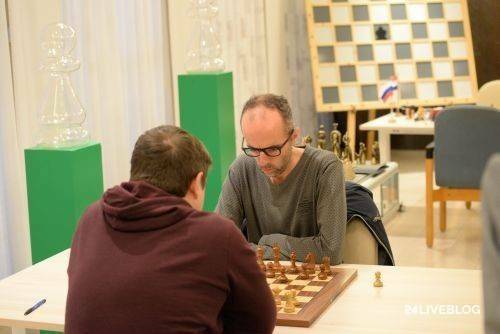 He was under pressure by Eelke de Boer for a while, but then the young player from Groningen slackened, and lost an exchange. He still had some compensation for a while, but things seem to be very much going Pruijssers' way now. The second semi-final, between Erik van den Doel and Dmitry Kryakvin, ended in a draw. 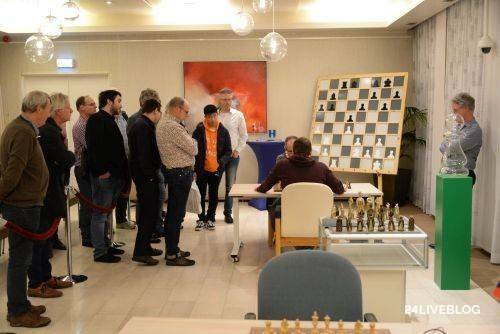 The playoff will take place in the Wedding Room of the town hall: Kryakvin starts with white, minimally 2 blitz games, 3 minutes each and 2 seconds added per move! 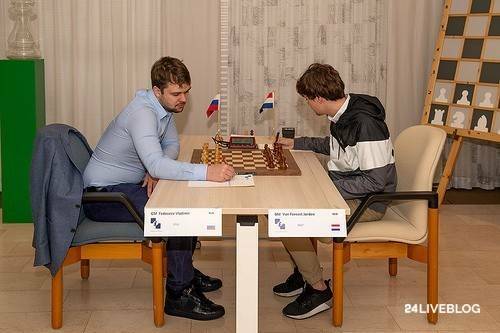 ... the Dutchman came back in the game and even outplayed his Russian rival in the endgame. 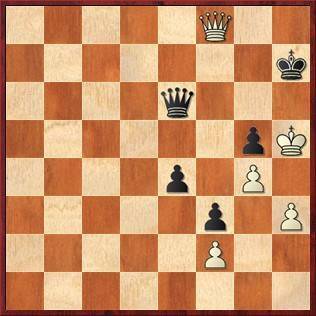 But when he had gained a pawn for which Kryakvin had to give his knight, a theoretical draw ensued in which Black's extra bishop was not enough for the win. In game 2 a London System came on the board just like in the regular game between these two players today. Van den Doel had a little something with white, but again used up too much time and when he could only just defend his two bishops with his rook, his time had already run out. Kryakvin and his wife Elena Tomilova were over the moon. 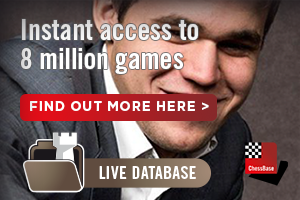 'So much money depending on one blitz game!' Dmitry gasped. Tomorrow Jorden can take a last shot at winning this tough match, in his final White game. 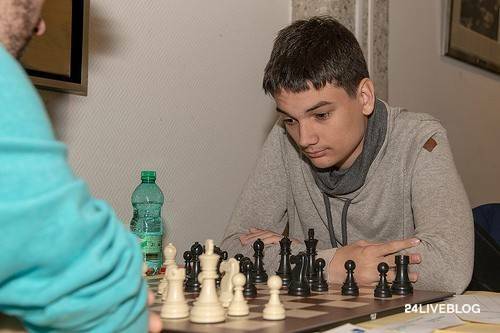 Today the excitement mainly came from the very tense blitz playoff between Dmitry Kryakvin and Erik van den Doel. In the end the Russian won 1½-½ and so qualified for the final against Bassem Amin, who beat Eltaj Safarli earlier today. There was not a lot of excitement in the 6.h3 Sicilian of Vladimir Fedoseev and Jorden Fedoseev, where the Dutchman equalized pretty easily with black with a few to-the-point moves. 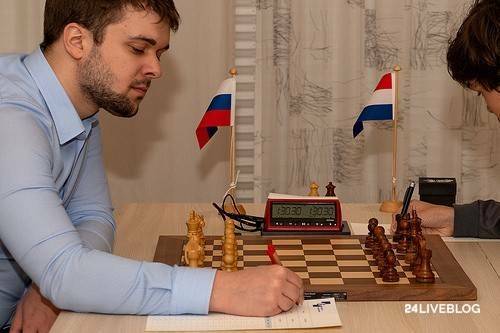 Then Fedoseev tried for a long time to squeeze water out of a stone, but he didn't manage: the score in this match is 2½-2½ going into the last round. 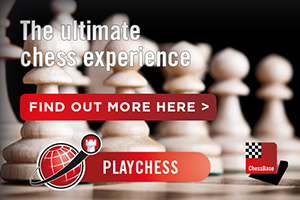 The game Shankland-Svidler also became a quite placid affair after White's 15th move, but one move earlier the American had missed an enormous chance, as he discovered later. Svidler had seen a few wild and crazy lines, but alas none of those came on the board: also a draw, and a 3-2 lead for Svidler.